Viewer Peter Thomas submitted a complaint to the BAI over an ad showing a sandwich filled with what he felt was a misleading number of chicken breast slices. A COMPLAINT OVER a TV ad for an “overstuffed” Subway sandwich has been rejected by the Broadcasting Authority of Ireland (BAI). Viewer Peter Thomas complained to the press watchdog that the ad – which ran on TV3 and 3e through March 2015 – showed a six-inch chicken chipotle sandwich filled with what he felt was a misleading number of chicken breast slices. The complainant alleged that he had verified in “a number of outlets” that the sandwich in question is served with only “two tablespoonfuls of tiny chicken pieces”. For this reason, he stated, the broadcast images were “doubly false” with regard to both “the nature and amount of what [is] actually served” in outlets. uncooked chicken would never be included in sandwiches served to customers. In response, TV3 stated that it ensures all ads aired on the channel abide by the BAI’s guidelines for commercial communication. 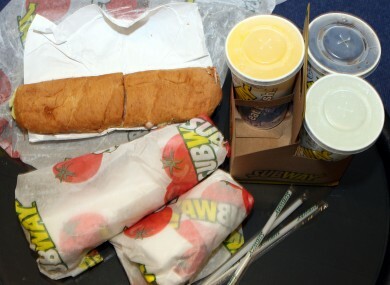 The broadcaster noted that it could not “reasonably be expected to conduct a survey of Subway outlets to compare the sold products with the images included in the actual advertisement”. The BAI unanimously rejected the complaint, saying it found no evidence in the complainant’s submission that the sandwich did not contain the set of ingredients shown in the ad. The watchdog determined that the ad was not false or misleading, and that the complaint against it was based on the subjective experience of only one customer. Email “Press watchdog rejects complaint over ad for 'overstuffed' Subway sandwich”. Feedback on “Press watchdog rejects complaint over ad for 'overstuffed' Subway sandwich”.